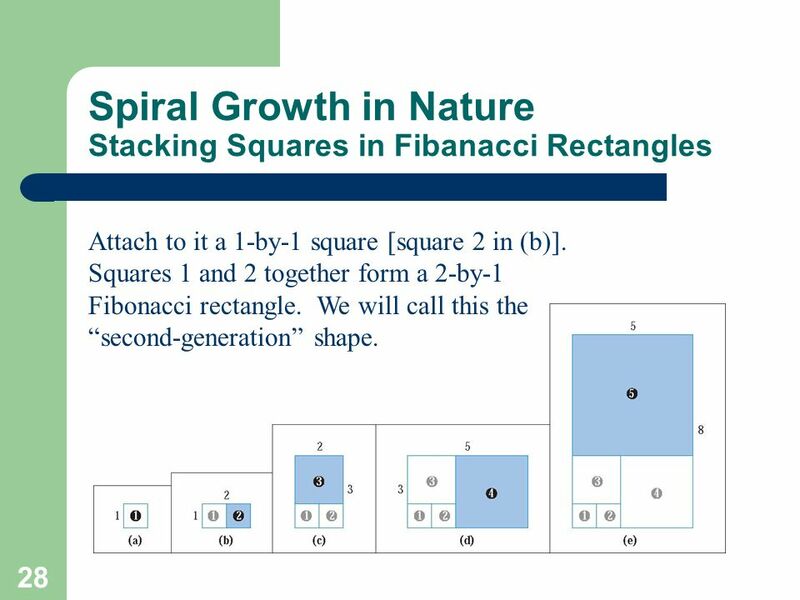 To generate the Fibonacci sequence and identify some of its properties. 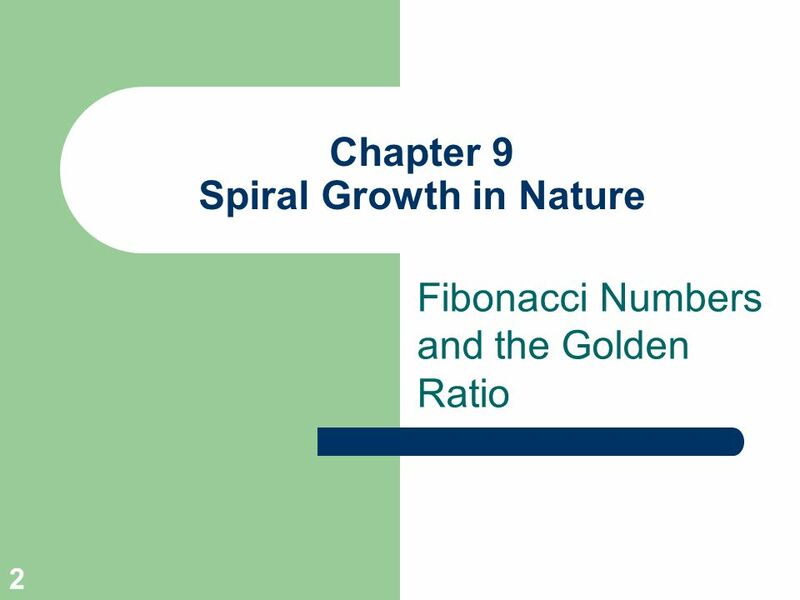 To identify relationships between the Fibonacci sequence and the golden ratio. 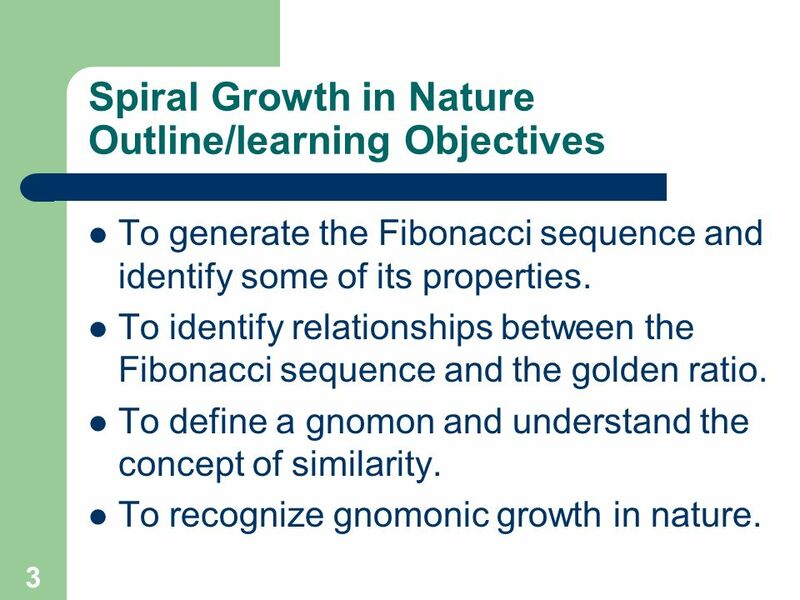 To define a gnomon and understand the concept of similarity. 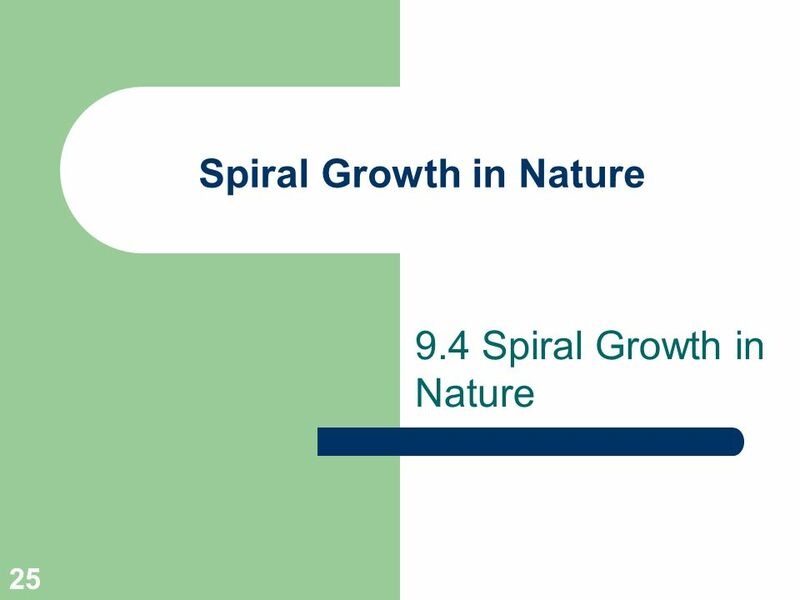 To recognize gnomonic growth in nature. The Fibonacci Sequence 1, 1, 2, 3, 5, 8, 13, 21, 34, 55, 89, 144, 233, 377,… The Fibonacci numbers form what mathematician call an infinite sequence– an ordered list of numbers that goes on forever. As with any other sequence, the terms are ordered from left to right. 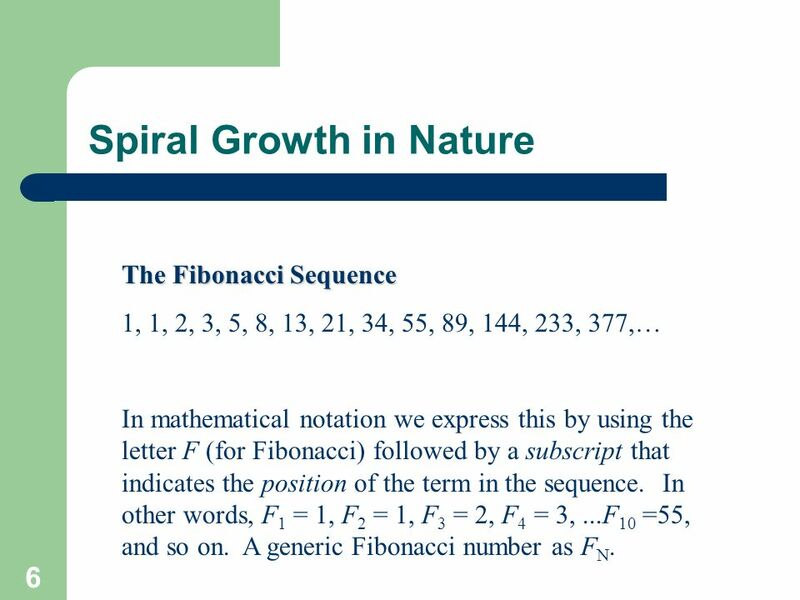 The Fibonacci Sequence 1, 1, 2, 3, 5, 8, 13, 21, 34, 55, 89, 144, 233, 377,… In mathematical notation we express this by using the letter F (for Fibonacci) followed by a subscript that indicates the position of the term in the sequence. In other words, F1 = 1, F2 = 1, F3 = 2, F4 = 3, ...F10 =55, and so on. 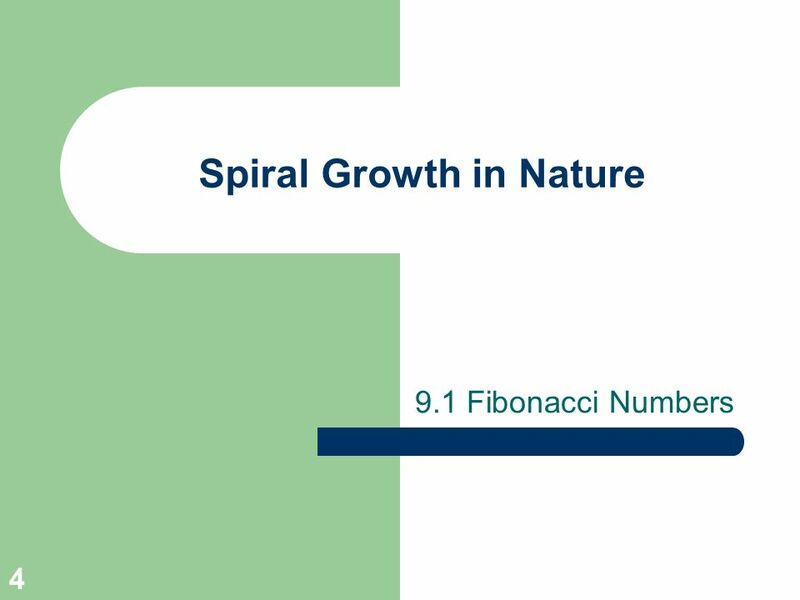 A generic Fibonacci number as FN. 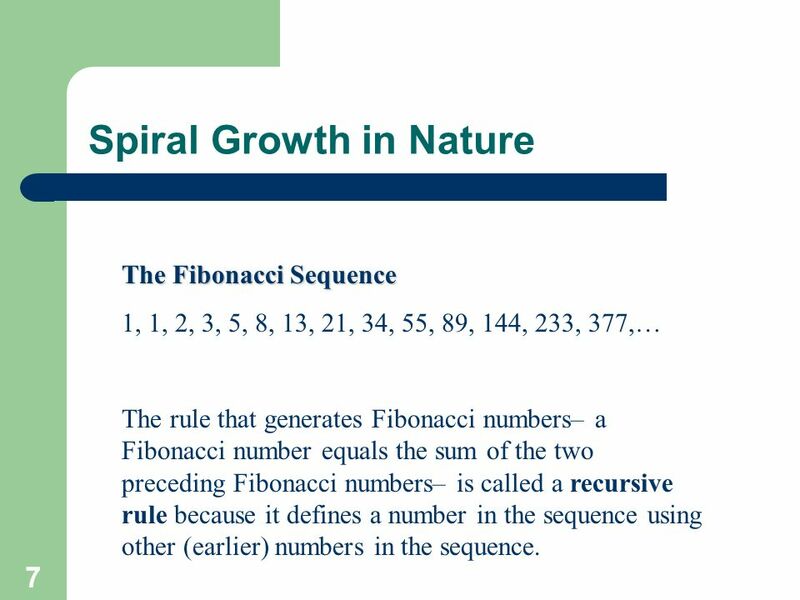 The Fibonacci Sequence 1, 1, 2, 3, 5, 8, 13, 21, 34, 55, 89, 144, 233, 377,… The rule that generates Fibonacci numbers– a Fibonacci number equals the sum of the two preceding Fibonacci numbers– is called a recursive rule because it defines a number in the sequence using other (earlier) numbers in the sequence. 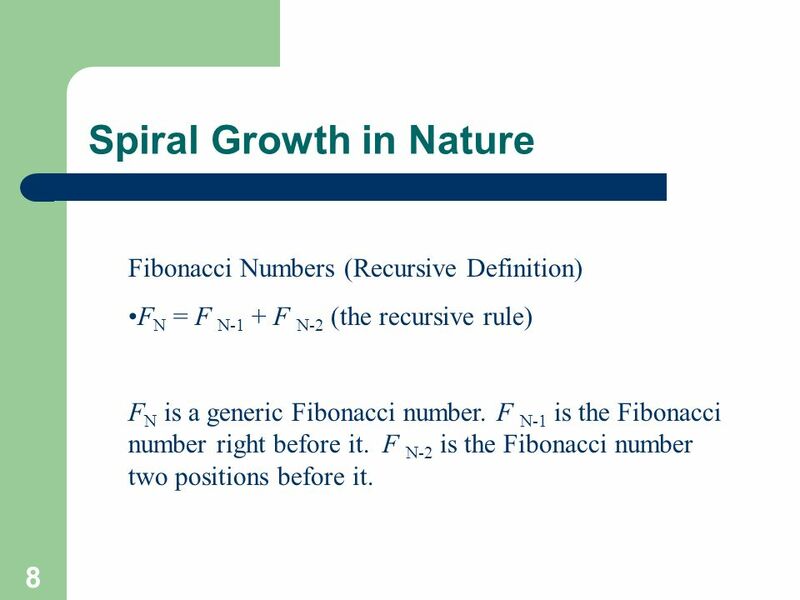 Fibonacci Numbers (Recursive Definition) FN = F N-1 + F N-2 (the recursive rule) FN is a generic Fibonacci number. 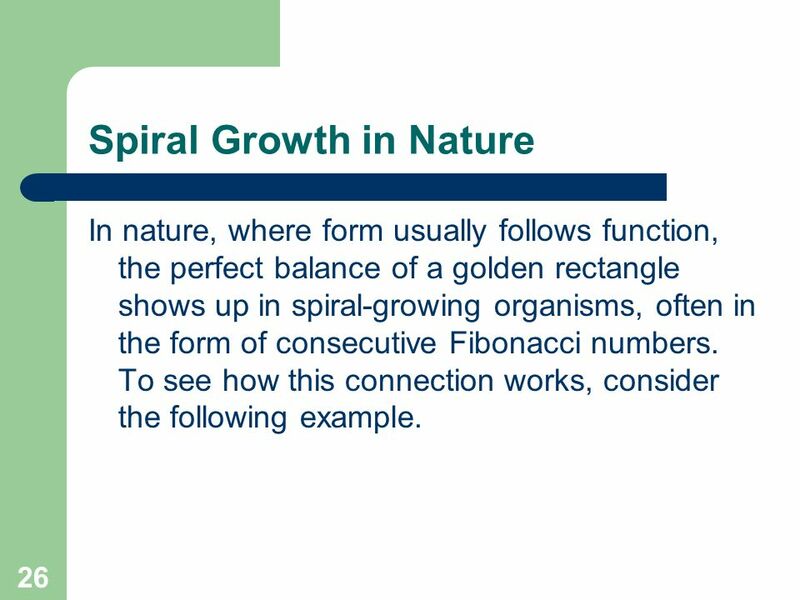 F N-1 is the Fibonacci number right before it. F N-2 is the Fibonacci number two positions before it. 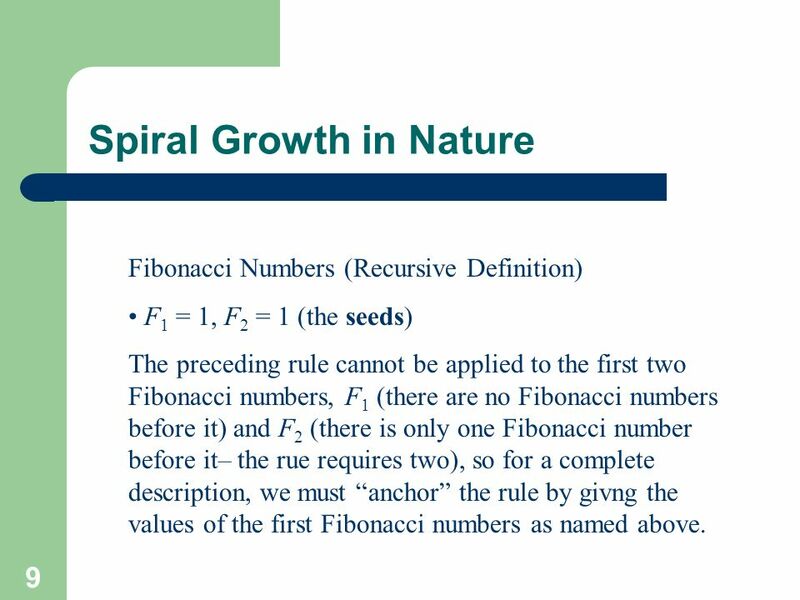 Fibonacci Numbers (Recursive Definition) F1 = 1, F2 = 1 (the seeds) The preceding rule cannot be applied to the first two Fibonacci numbers, F1 (there are no Fibonacci numbers before it) and F2 (there is only one Fibonacci number before it– the rue requires two), so for a complete description, we must “anchor” the rule by givng the values of the first Fibonacci numbers as named above. Is there an explicit (direct) formula for computing Fibonacci numbers? 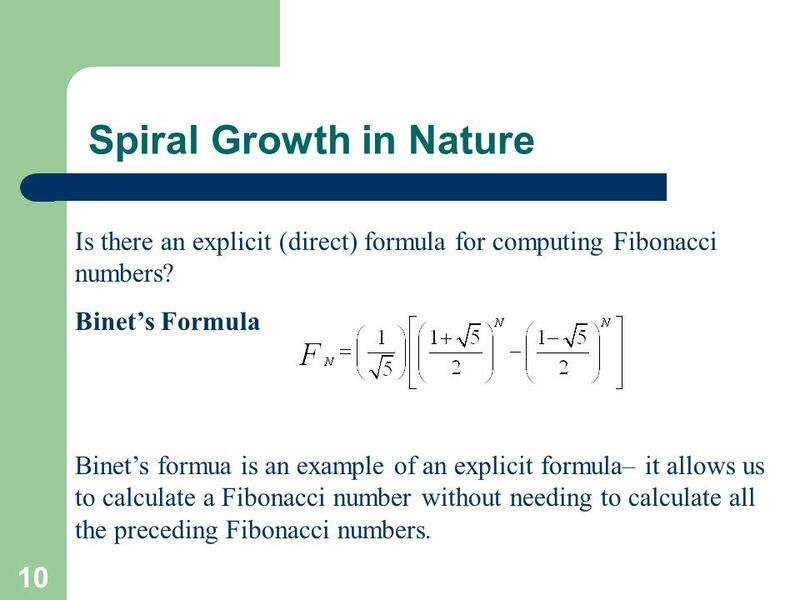 Binet’s Formula Binet’s formua is an example of an explicit formula– it allows us to calculate a Fibonacci number without needing to calculate all the preceding Fibonacci numbers. 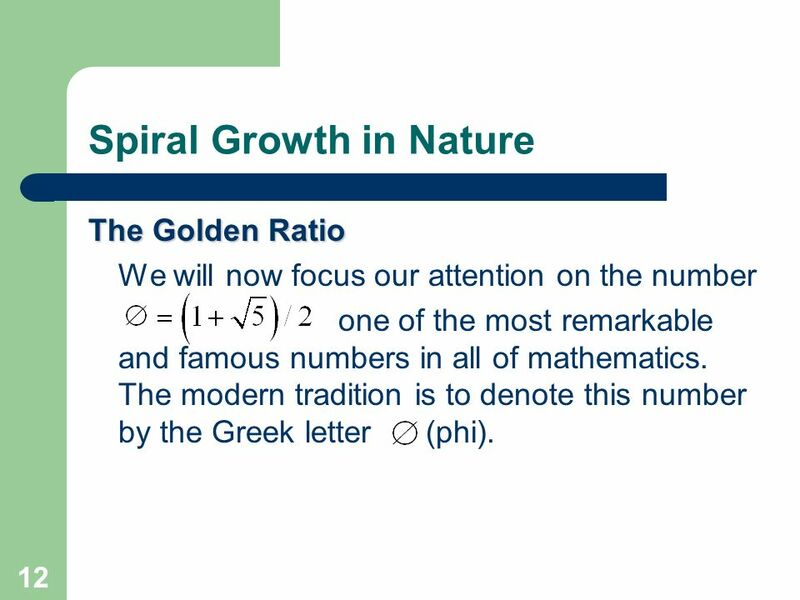 The Golden Ratio We will now focus our attention on the number one of the most remarkable and famous numbers in all of mathematics. The modern tradition is to denote this number by the Greek letter (phi). Powers of the Golden Ratio In some ways you may think of the preceding formula as the opposite of Binet’s formula. 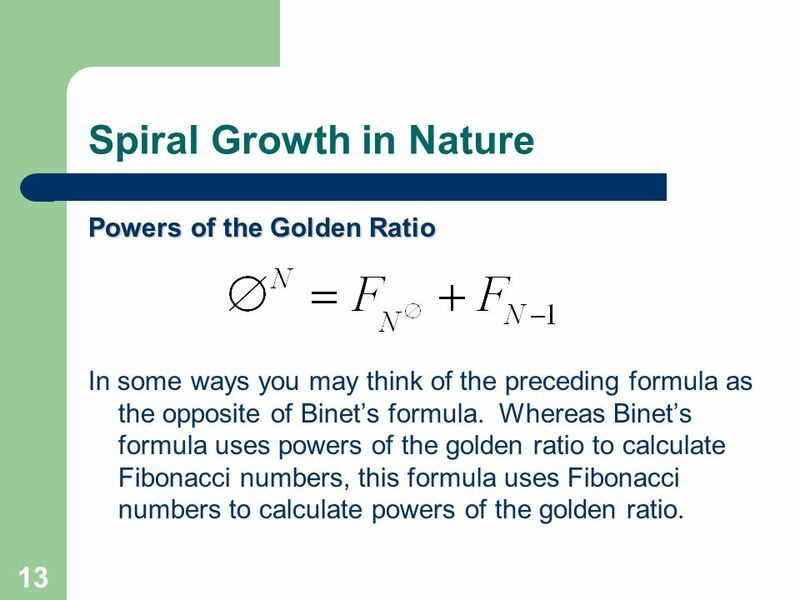 Whereas Binet’s formula uses powers of the golden ratio to calculate Fibonacci numbers, this formula uses Fibonacci numbers to calculate powers of the golden ratio. 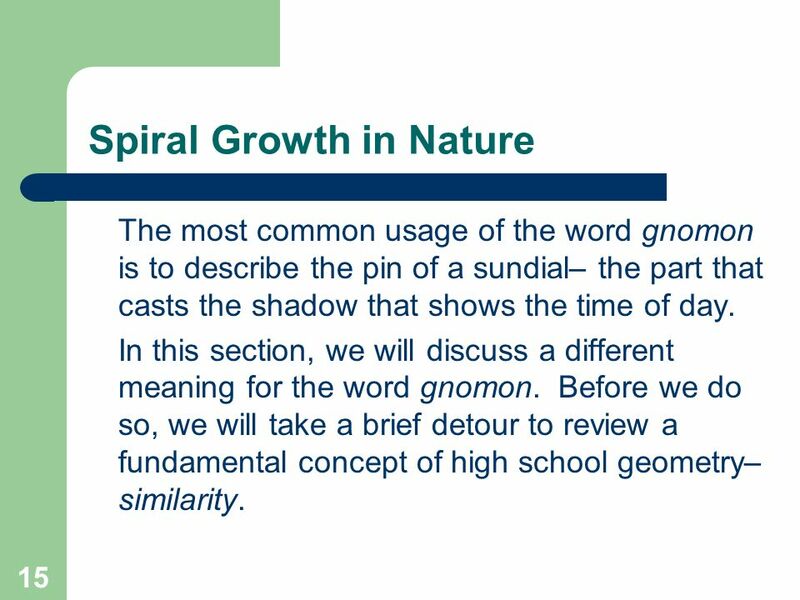 The most common usage of the word gnomon is to describe the pin of a sundial– the part that casts the shadow that shows the time of day. In this section, we will discuss a different meaning for the word gnomon. Before we do so, we will take a brief detour to review a fundamental concept of high school geometry– similarity. We know from geometry that two objects are said to be similar if one is a scaled version of the other. 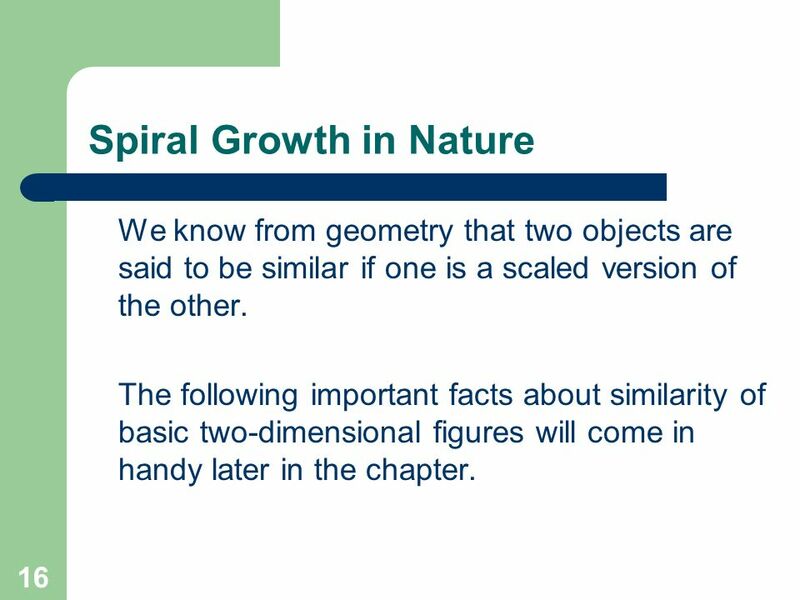 The following important facts about similarity of basic two-dimensional figures will come in handy later in the chapter. 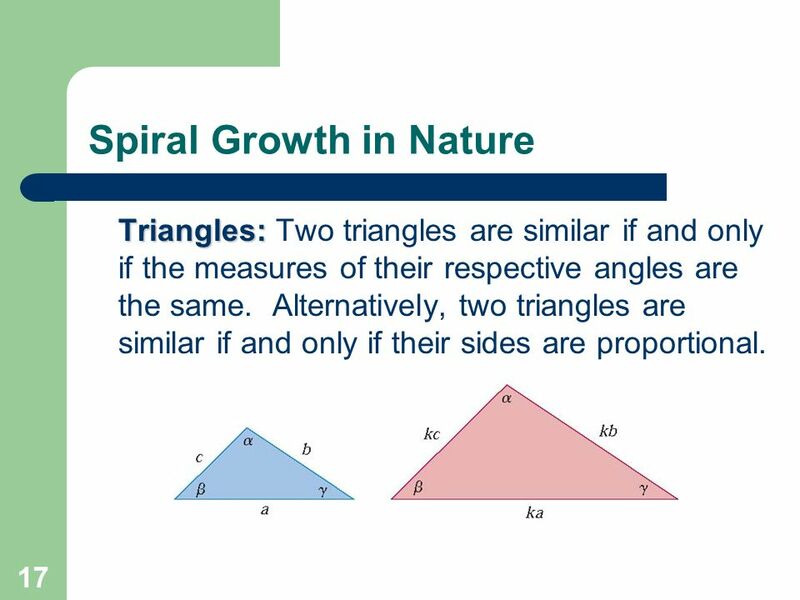 Triangles: Two triangles are similar if and only if the measures of their respective angles are the same. Alternatively, two triangles are similar if and only if their sides are proportional. Squares: Two rectangles are always similar. 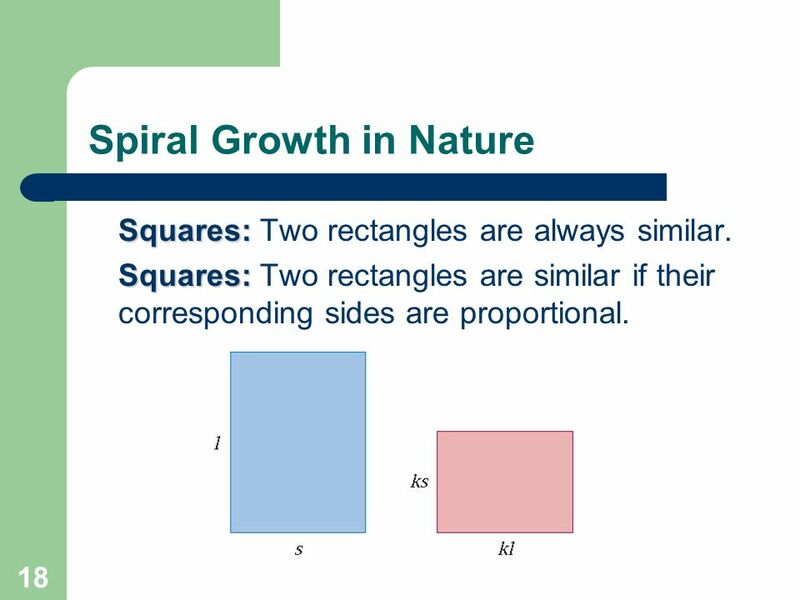 Squares: Two rectangles are similar if their corresponding sides are proportional. Circles and disks: Two circles are always similar. Any circular disk (a circle plus all of its interior) is similar to any other circular disk. 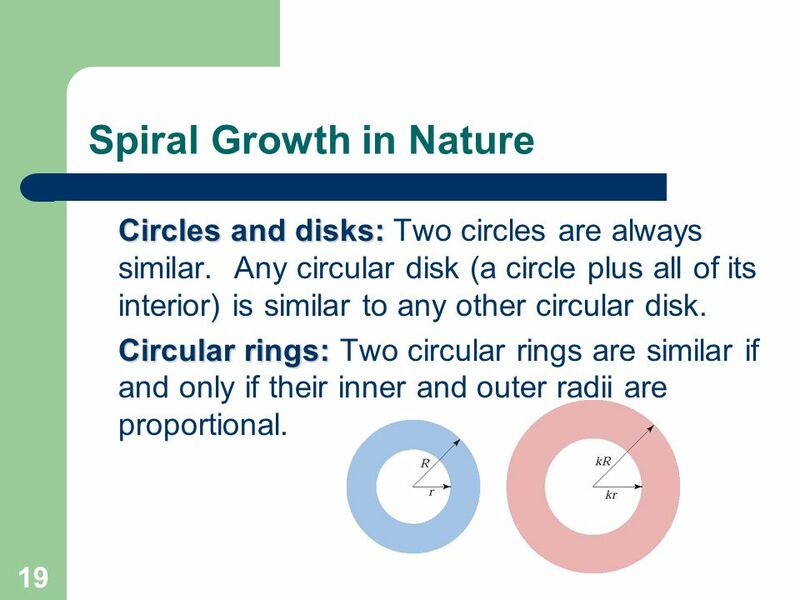 Circular rings: Two circular rings are similar if and only if their inner and outer radii are proportional. 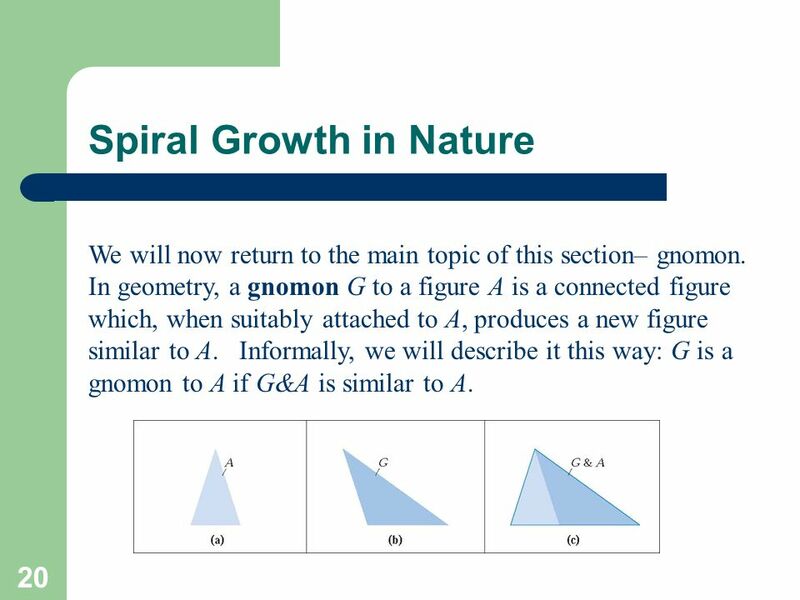 We will now return to the main topic of this section– gnomon. 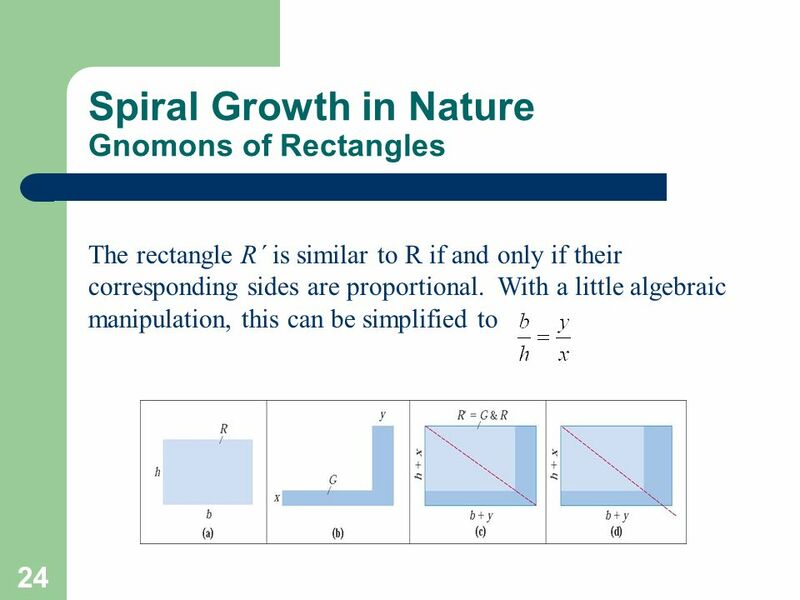 In geometry, a gnomon G to a figure A is a connected figure which, when suitably attached to A, produces a new figure similar to A. 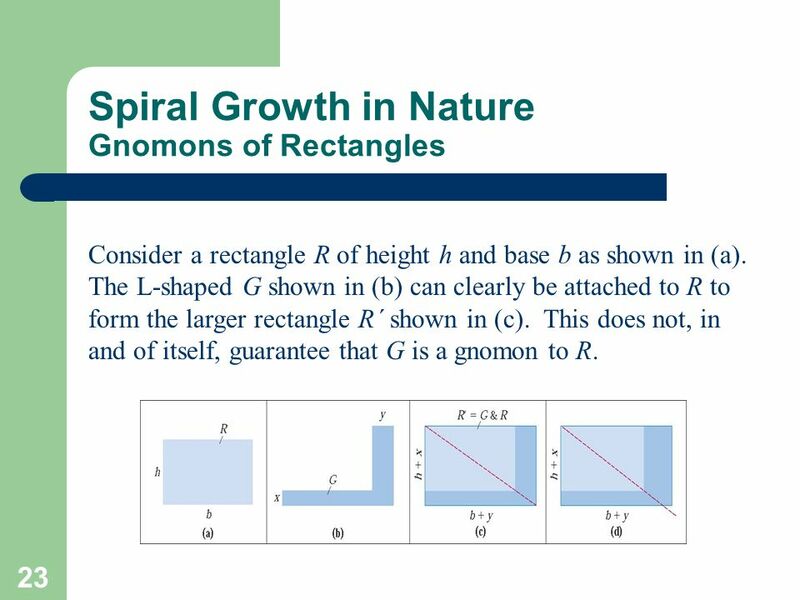 Informally, we will describe it this way: G is a gnomon to A if G&A is similar to A. Consider the square S in (a). 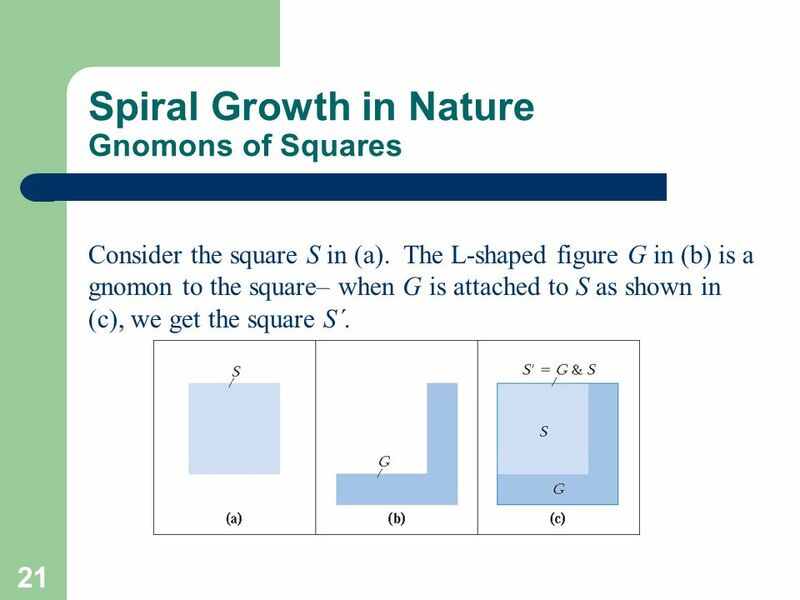 The L-shaped figure G in (b) is a gnomon to the square– when G is attached to S as shown in (c), we get the square S´. Consider the circular disk C with radius r in (a). 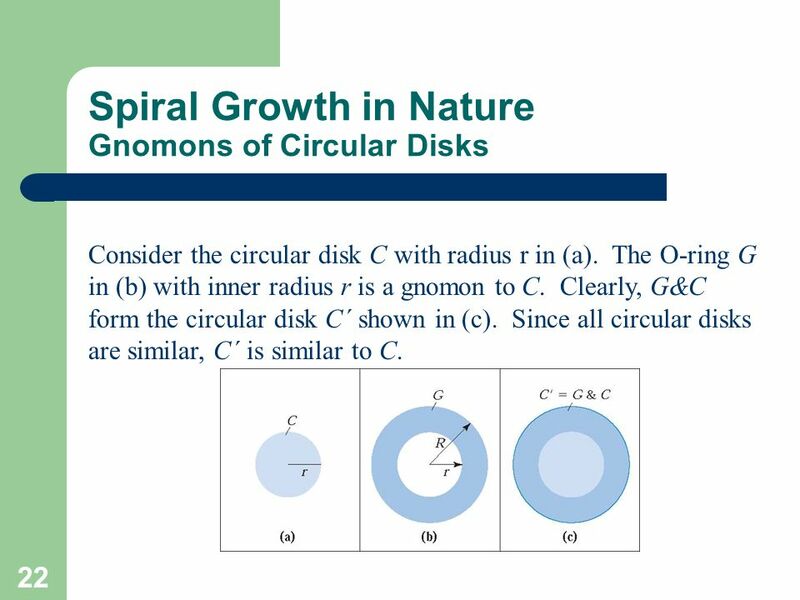 The O-ring G in (b) with inner radius r is a gnomon to C. Clearly, G&C form the circular disk C´ shown in (c). Since all circular disks are similar, C´ is similar to C.
Consider a rectangle R of height h and base b as shown in (a). The L-shaped G shown in (b) can clearly be attached to R to form the larger rectangle R´ shown in (c). 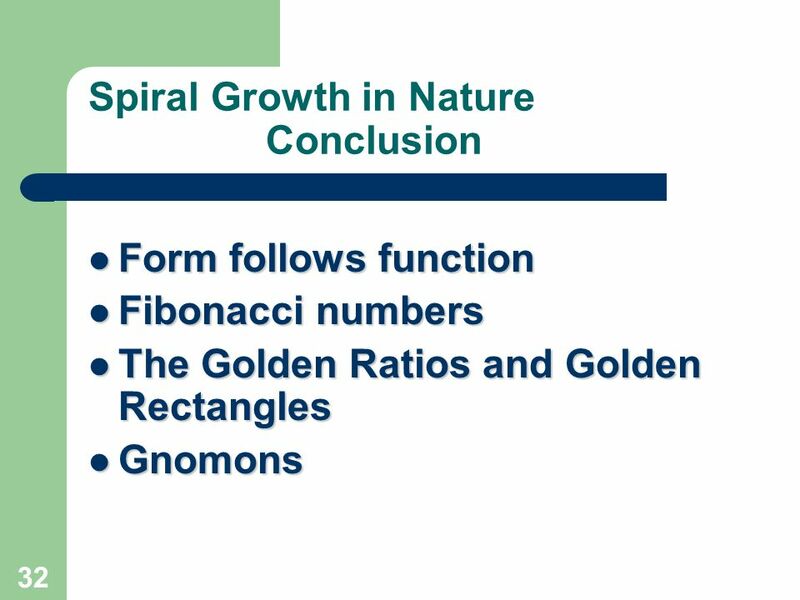 This does not, in and of itself, guarantee that G is a gnomon to R.
In nature, where form usually follows function, the perfect balance of a golden rectangle shows up in spiral-growing organisms, often in the form of consecutive Fibonacci numbers. To see how this connection works, consider the following example. Start with a 1-by-1 square [square 1 in (a). Attach to it a 1-by-1 square [square 2 in (b)]. Squares 1 and 2 together form a 2-by-1 Fibonacci rectangle. We will call this the “second-generation” shape. For the third generation, tack on a 2-by-2 square [square 3 in (c)]. 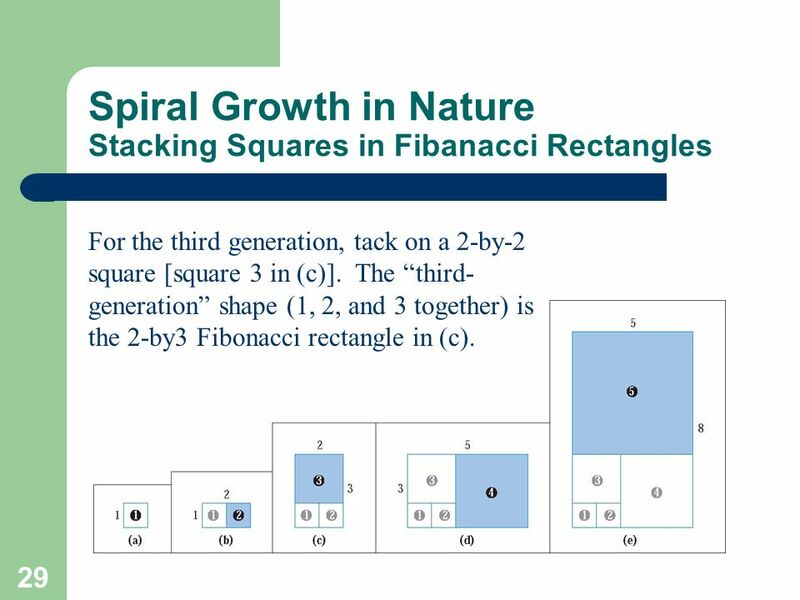 The “third-generation” shape (1, 2, and 3 together) is the 2-by3 Fibonacci rectangle in (c). Next, tack onto it a 3-by-3 square [square 4 in (d)], giving a 5-by-3 Fibonacci rectangle. Then tack o a 5-by-5 square [square 5 in (e)}, resulting in an 8-by-5 Fibonacci rectangle. We can keep doing this as long as we want. Download ppt "Excursions in Modern Mathematics Sixth Edition"
Chapter 3: Top-Down Design with Functions Problem Solving & Program Design in C Sixth Edition By Jeri R. Hanly & Elliot B. Koffman. 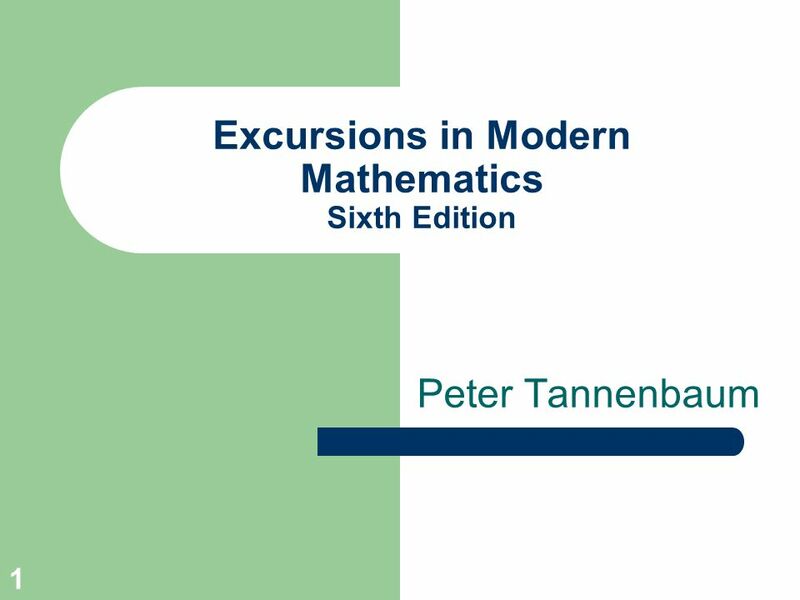 EXCURSIONS IN MODERN MATHEMATICS SIXTH EDITION Peter Tannenbaum 1.